The bier pours a rich very deep amber with ruby hues and a very rich off white head. This brew is also highly carbonated with tons of tiny bubbles rising up from the bottom of the glass. The head seemed to implode from within. The high carbonation seemed to expand the bubbles in the head until they just collapsed. Sweet malts, fruity esters and hints of those Earthy yeasty aromas on the nose. Nice, Very Nice! The taste starts out with sweet malts up front then a very refreshing and cleansing effervescence over your tongue. In the back end there is a hint of sour or tartness with a impressive toasted maltiness. The finish is fairly dry for a Belgian and the final aftertaste is a toasted malty goodness. As the bier warms it really opens up. 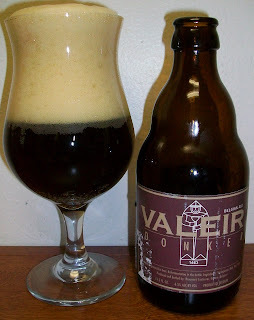 It is much maltier with dark rich malts. The malts are picking up a much more toasted flavor now. This was a very good bier. It did not have that wow factor but it was a well crafted Belgian Dark Ale and I would by this again. A very nice clean and somewhat refreshing Belgian Dark, It’s a solid B for me.